Artist Holly Van Hart is a committed optimist. 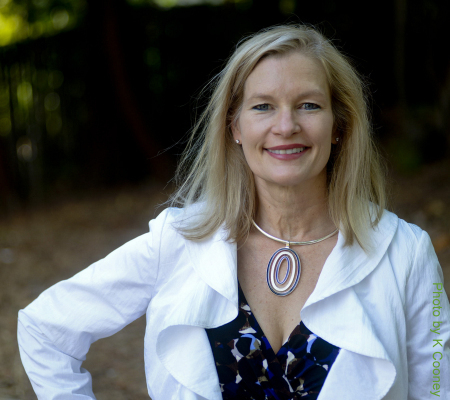 Her work expounds on the idea that finding serenity in the face of life's trials and turmoil is a matter of staying alert to possibility and open to change. 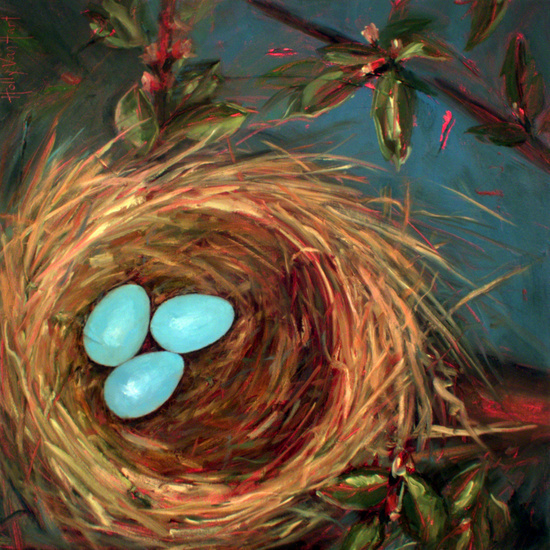 In many of her recent paintings images of eggs and nests serve as metaphors for life's dynamic opposing forces. I recently interviewed Holly Van Hart and asked her about the unfolding of her career and her vision as an artist. Holly Van Hart Tell me about your early years. When did you know you were an artist? I was raised in New York City by my artist Mom and police officer Dad, and always knew I was an artist. As a girl, my Mom taught us drawing and painting, and freely shared her high-quality art supplies. I usually had multiple art projects going, including painting, ceramics, crocheting, and calligraphy projects. At college I majored in engineering which didn't leave much time for art. But later, while working in high tech, I pursued painting passionately as a hobby - taking many classes, reading hundreds of books, forming an art critique group, and painting every spare minute. Also, I was entering painting competitions, winning awards, and selling my work. Dream Weaver, Oil on canvas, 40 x 30 inches How and when did you decide to leave your career in the tech industry and devote yourself to art? I enjoyed a fulfilling, 20-year career in the tech industry, and painting was a hobby. Over time, the artist side of me became more consuming, then all consuming. In 2012 I decided to make the switch and paint full-time. In 2013 my painting 'Possibilities Abound' won the California Statewide Painting Competition and that gave a big boost to my art career. As a professional artist I work harder than I ever did before. But now my life and my work are all one thing, which feels more authentic and satisfying. I turn 50 later this month, and am psyched about having many decades ahead as a professional artist. This definitely feels like what I was meant to do. Larger Than Life, Oil on canvas, 54 x 72 inches Nests are a recurring image in your work: tell me about them and why you are attracted to them. For the last 18 months I've been totally absorbed with my 'Possibilities Abound' series. This series uses larger-than-life birds' eggs and nests to symbolize the promise of our own capabilities, to be nurtured and explored and stretched to their fullest potential. That's what really excites me. DeWitt Cheng nailed it in his recent essay about my work, and I'll quote him here, "These works about potential and metamorphosis, then, are clearly autobiographical, but they're also universal (as the deepest, most personal work often is, paradoxically)." My work is personal because it relates to my switch to art from high tech. But there's another personal slant to it . . . it reflects my experience with Silicon Valley's culture. Silicon Valley has this unique culture of creativity and unrelenting optimism. New technologies are created every day, and are transforming lives around the world. This is a place where anything is possible. I love that. Interestingly enough, Preston Metcalf, Chief Curator at the Triton Museum of Art, had an additional interpretation of my work. Preston identified more with the nests than the eggs. He thought that we are each metaphorically a strand or twig that combines with our fellow beings to find the opportunities that abound when we realize that we are all connected. 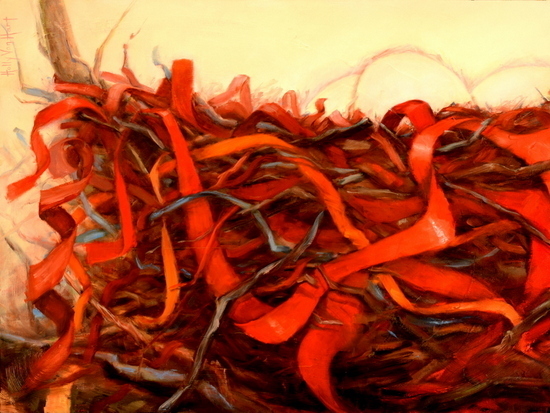 Nest at Night, Oil on canvas, 36 x 18 inches What kinds of energies and emotions do you want your work to transmit? I'd like people who look at my work to feel the 'anything is possible' vibe and to be energized by that. Our lives are as large as we make them. Nestled, Oil on canvas, 30x40 inches Your switch to full-time artist is one 'anything is possible' story. Tell us another. Sure, here's one from my early 20s. I wanted to take 6 months off work to go travel and explore the world, but thought there would be too many obstacles. One was that my family wasn't big on international travel so they wouldn't understand. Another was that I didn't want to have to quit my engineering job. Also I had to pay off my student loans and would need to save some pennies to pull off the travel idea. A friend coached me and helped me see that these weren't such big obstacles. Then I took the leap. Along with a girlfriend, we made the case and were granted leaves of absence from our engineering jobs. We bought globe-hopping plane tickets, and had the time of our lives backpacking across Australia, Asia, and Africa for half a year. That experience definitely opened up my thinking about what's possible in life. Opportunity, Oil on canvas, 30x40 inches How do you develop your images? Everything I'm doing right now is in the 'Possibilities Abound' series of oil paintings. Within that context, I first think about what message to convey, and then about which subjects, colors, textures, and style will enable me to say it best. Next that idea needs to get turned into a design that is fresh, compelling, and inspired. These things are typically 80% baked before I start painting, and the rest happens through the painting process. Well, it doesn't just happen as simply as that. This last 20% is critical and requires huge amounts of time and energy and concentration. By the time a painting is done, it has 5-10 layers of oil paint, and has required lots of inspection and introspection over a period of months. 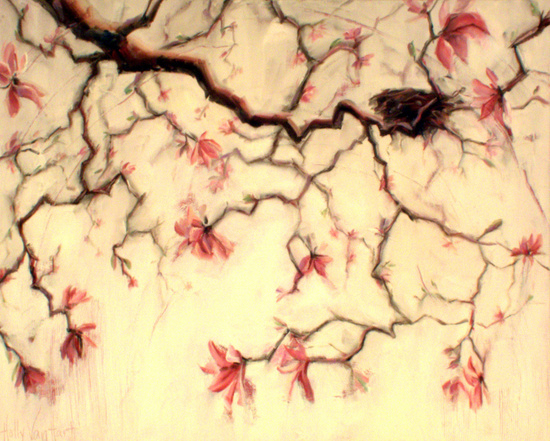 Regarding the subjects in my work (nests, eggs, branches, magnolias, cherry blossoms, sticks, feathers, ribbons), some of the inspiration comes from photo references and some comes from my imagination. I like using a combination of each. It might sound counter-intuitive, but the more that comes from my imagination, the longer it takes to create the painting. Not every painting succeeds. Not knowing whether a painting will succeed or fail keeps me alert. I think it also lends a certain energy and freshness to the work. The last part of the process is naming the painting, and the title for each painting typically gives away my intent for it. Also, my blog postings reveal even more background and context. At the same time, I aim to leave plenty room for viewers to make their own interpretations. Possibilities Abound, Oil on canvas, 40 x 30 inches Is your work all about optimism? Sure. But not naively so. In life, and in my work, excitement about life's possibilities is usually tempered by fear of the risks. I like to convey the fine balance between the beauty of nature, and her unseen forces and risks. Look closely at my paintings, and you'll see heavily textured organic swirls throughout each one. The texture is applied first (before the eggs and nests are painted), and is meant to represent threats to the eggs and nests. Examples include predators, wind, rainstorms, and humans. These textured swirls sometimes align with the subject of the painting, and sometimes go against the natural lines of what's represented in the painting. That's on purpose. It mirrors the complexity of our lives. Possibilities On High, Oil on canvas, 24 x 30 inches Who are some artists that you admire? I admire all artists who create something daring and different. Some of my favorites include Turner for his expressionistic landscapes, Georgia O'Keeffe for her striking images of flowers and bones, and Mark Rothko for his awe-inspiring color fields. Each of these artists challenged current-day artistic conventions as well as social conventions. Ditto for the poet Walt Whitman. I admire his controversial and poignant poems about human nature and connectedness. Serenity, Oil on canvas, 20x20 inches What are your interests outside of painting? My absolute favorite thing is spending time with family and friends. So much the better if that time can be combined with mountain biking, hiking, traveling, or consuming super-sized quantities of dark chocolate.